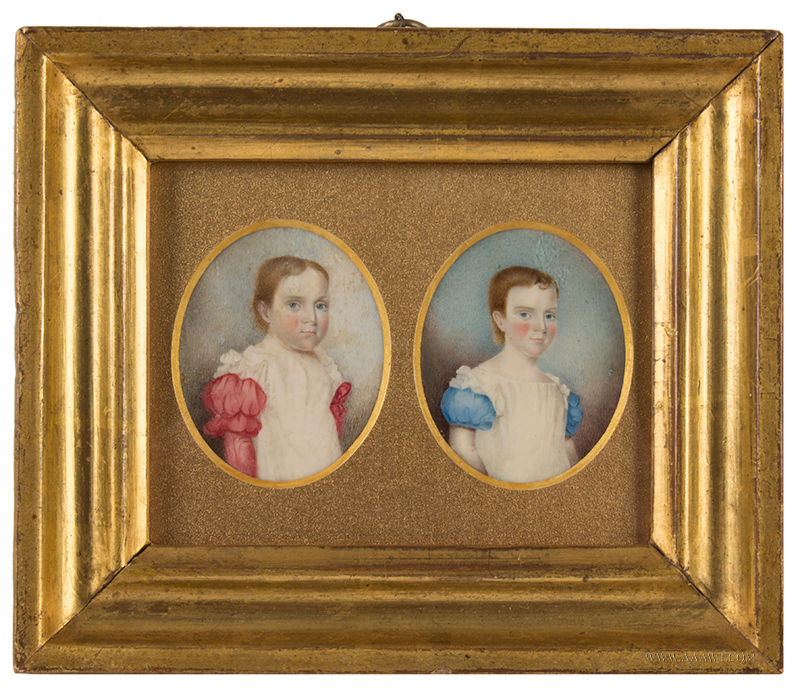 The work is clean and is mounted in an appropriate modern frame. 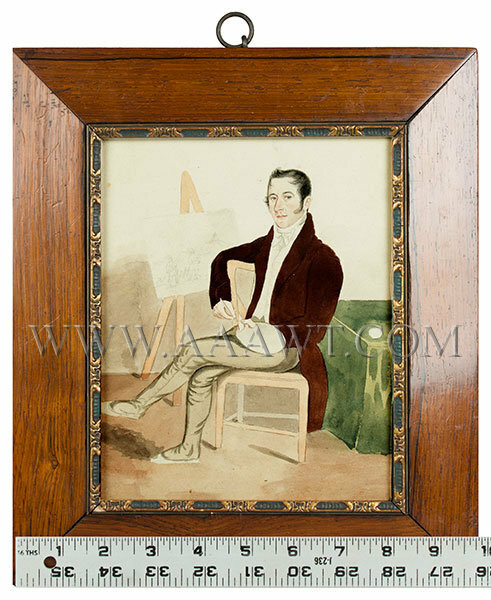 (Frame: 6 x 4.5"; view: 2.75 x 4.25"
The subject is seated in an armchair, he holds a quill pen, at a table draped in blue on which sits a desk standard, books and papers. 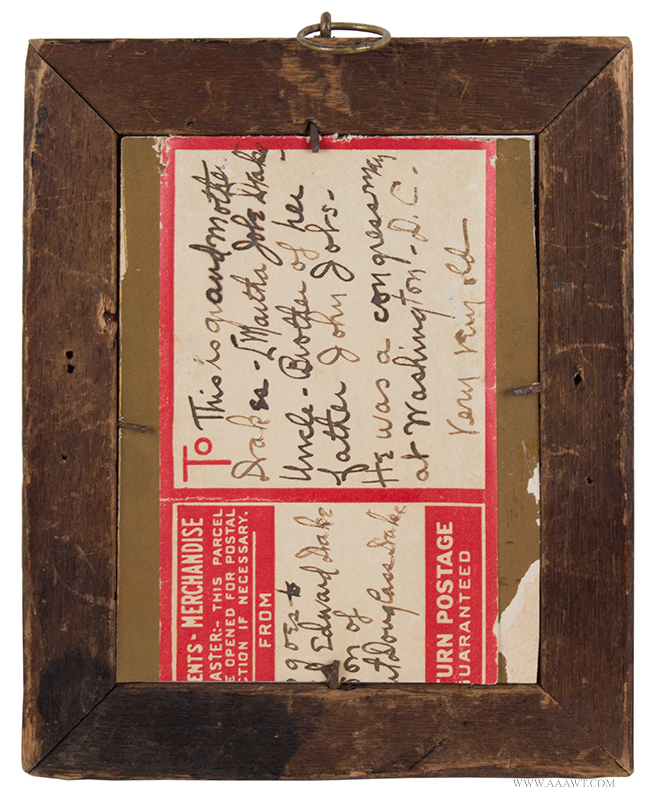 A photocopy of a label is attached to the back; the original is likely sealed within the enclosed back; S. Jennings – Carver and Gilder, 5 Goswell Street. 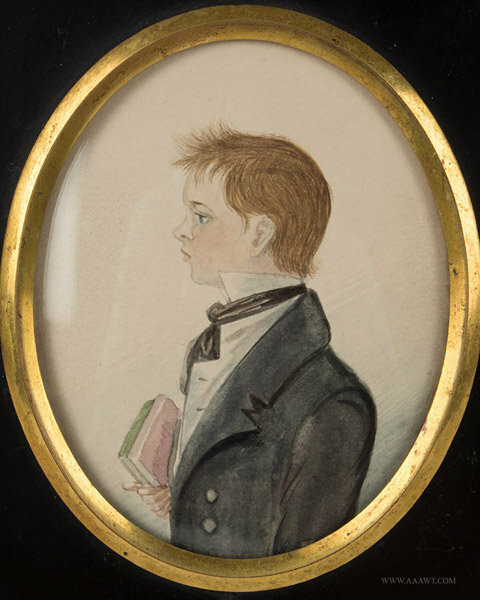 Jennings was lactated at 5 Goswell St, London 1826-1837. 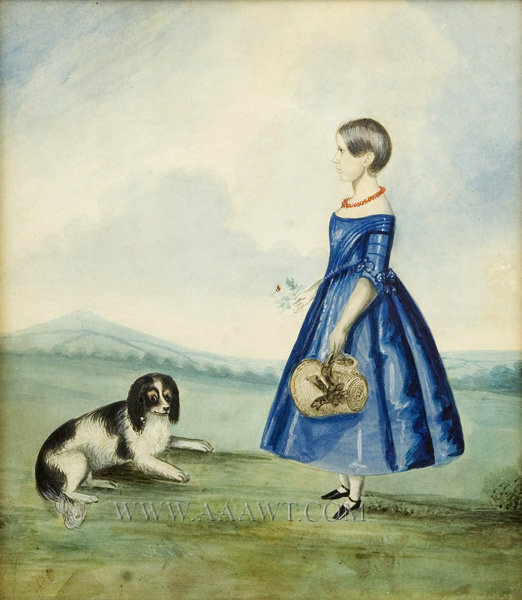 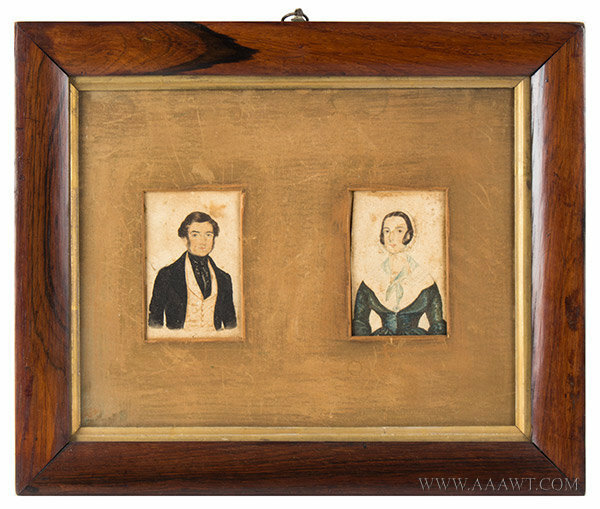 A lovely circa 1830s work displaying Day’s oeuvre such as hair detail Henry W. Ditman (1809-1872) Elizabeth Ditman (1813-1877) Henry was originally a farmer and blacksmith in Philadelphia; Henry, according to the December 13, 1889 Philadelphia Inquirer, was a lieutenant in the Frankford police many years before. 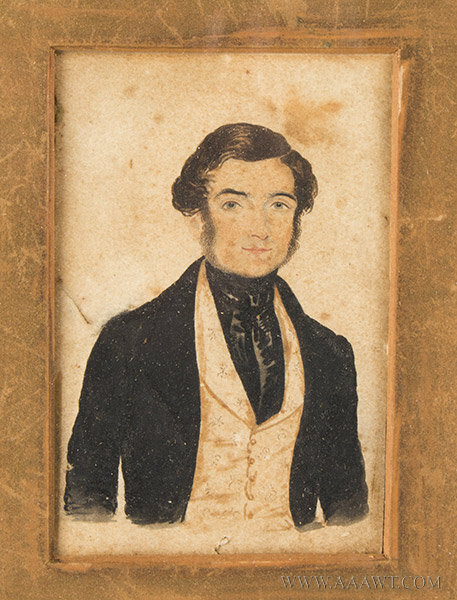 Ditman Street in Philadelphia was named for Henry Ditman. 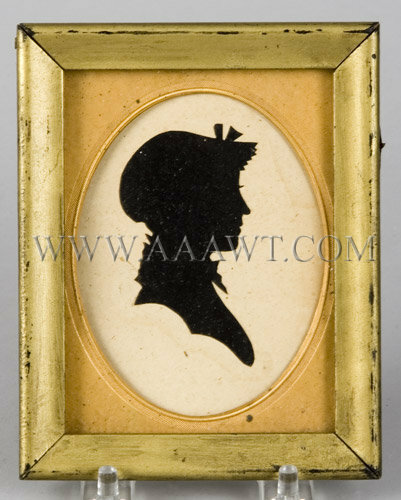 The Renown Silhouette Artist Arrived in America in July of 1839 Signed Lower-left: Edouart/fecit 1842/Boston/U.S. 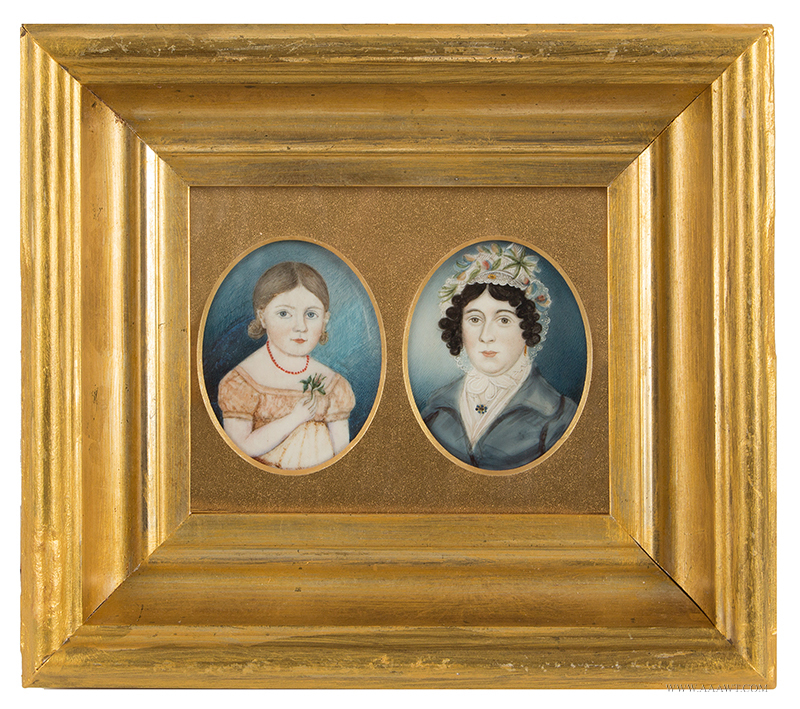 Mounted in period frame; not examined out of frame. 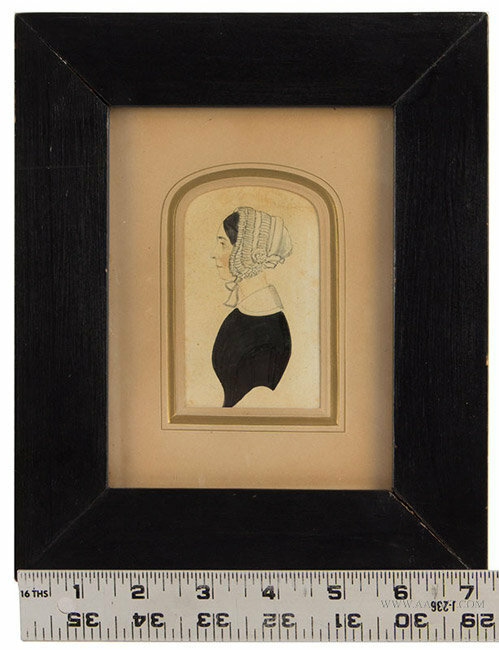 Nice early frame. 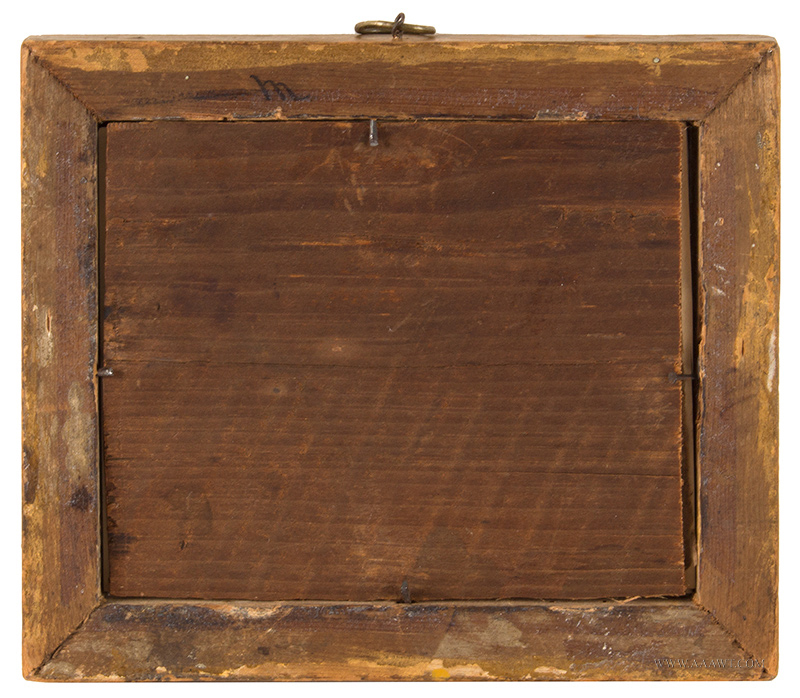 Back removed and reinstalled a long time ago; back period-possibly original; great patina, some foxing. 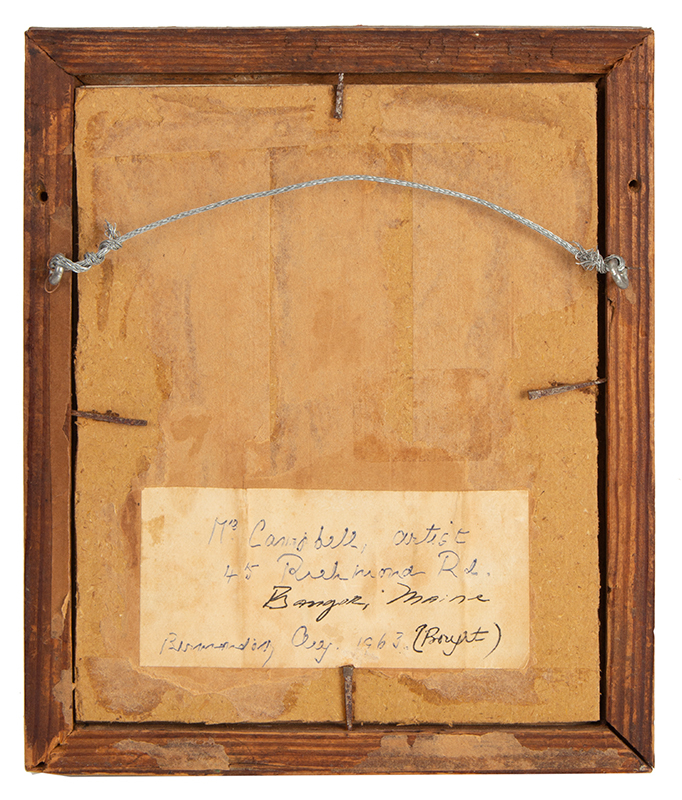 Inscribed on the gentleman’s undisturbed backboard papers is: Ladys [sic] & Gentn. 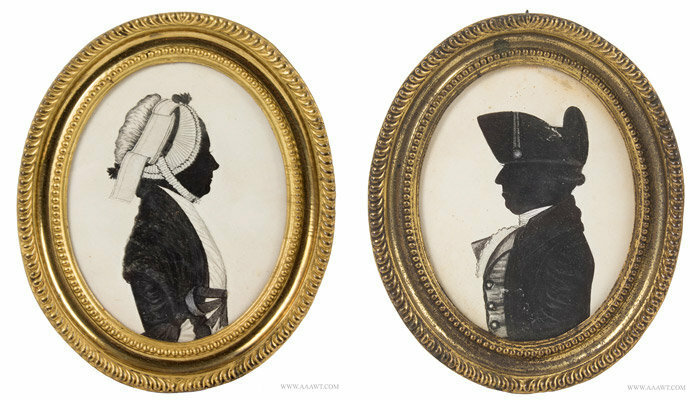 [sic] May have more Copies without a second sitting---Old shades accurately reproduced & draft’d [sic] in the present taste by Clarke Church (possibly Yard; illegible) – Exeter. 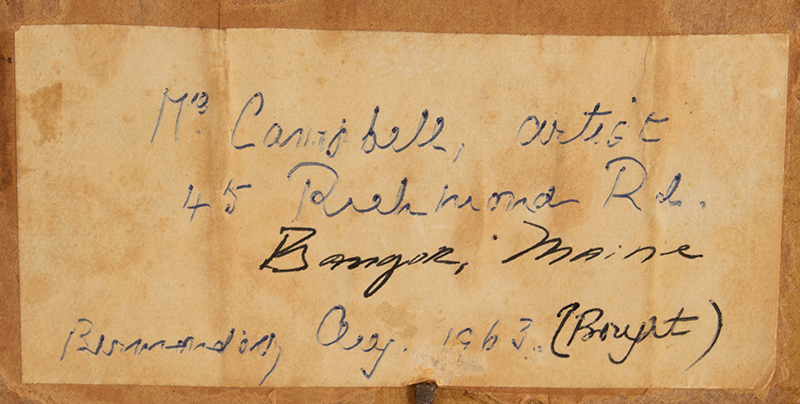 Inscribed on the ladies verso: Ladies & Gentn. 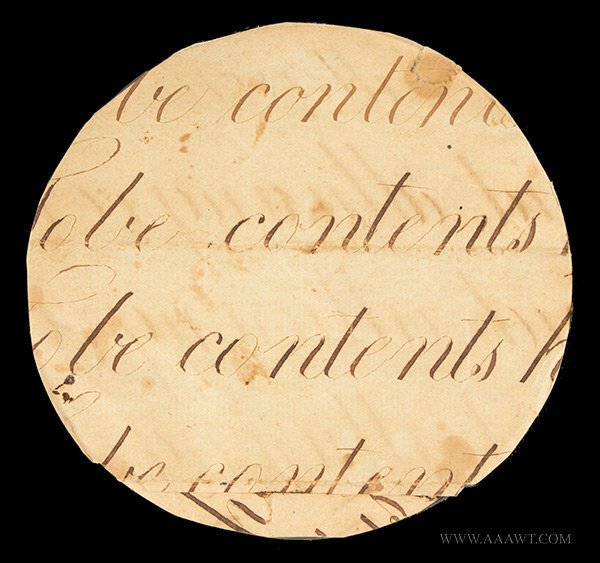 [sic] may have more Copies with out [sic] the inconvenience of a second sitting. 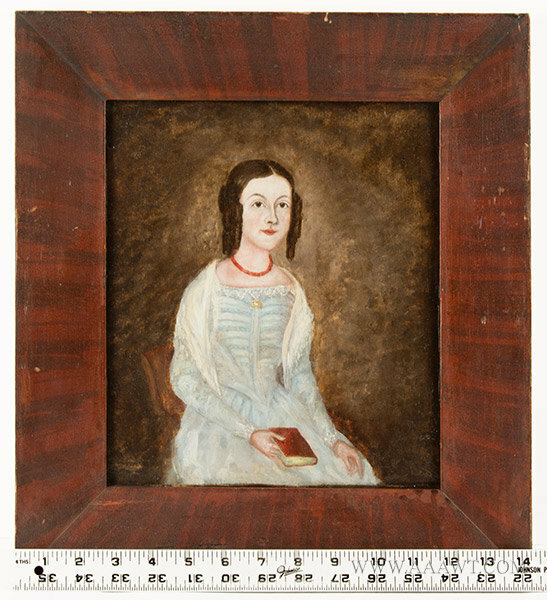 Plumed or crowned figure with extended sword directed towards a lion (England) and wearing red and white striped dress; the date "1776" is displayed on her chest. 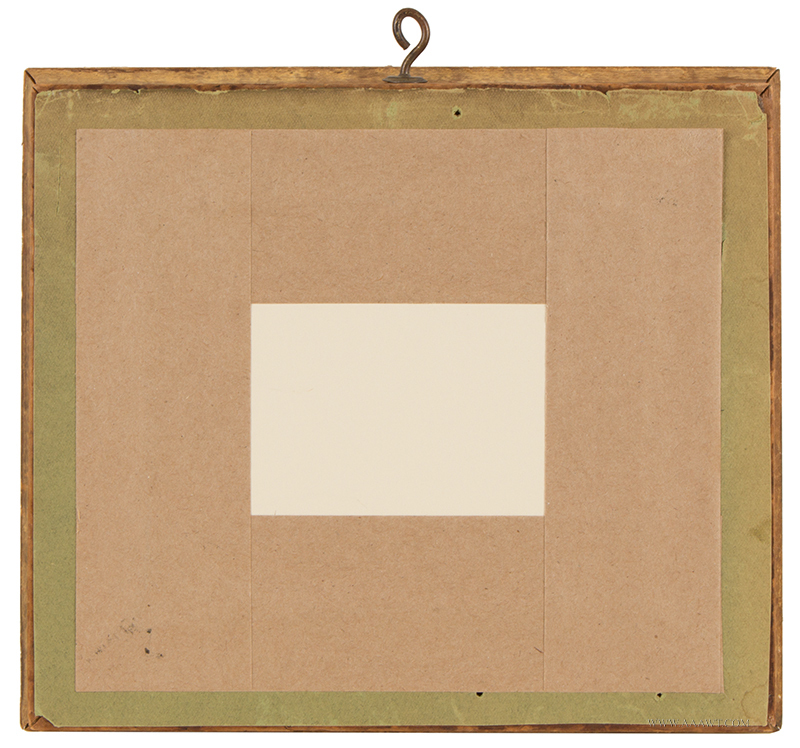 The work is centered by flags, that which is on the right is emblazoned with "US". 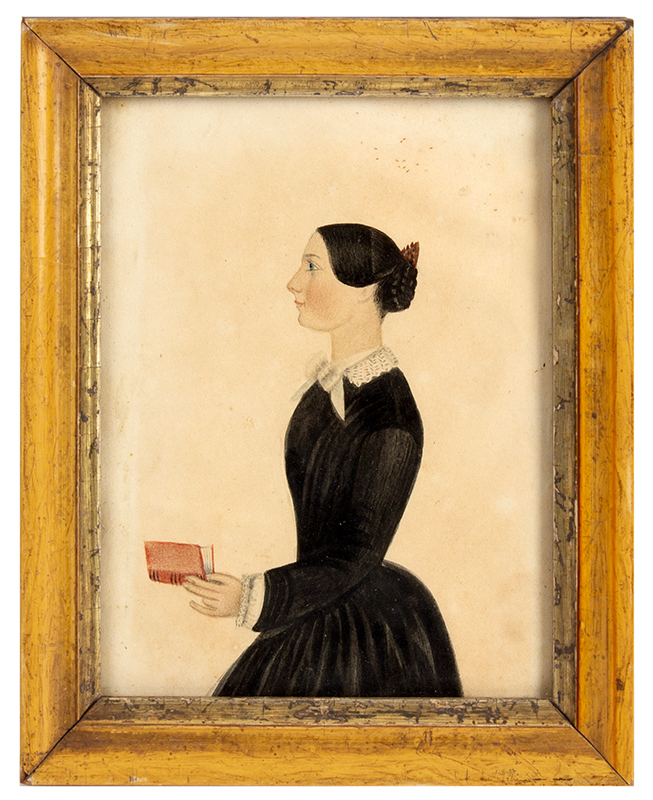 The piece was worked on what appears to be ledger paper and is mounted within a red painted frame. 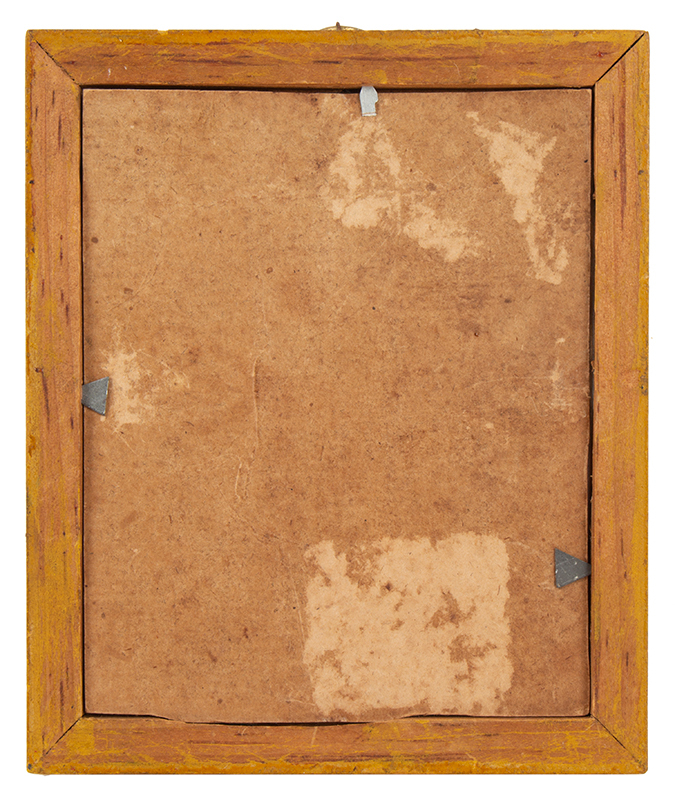 We have examined the verso finding no useful information. 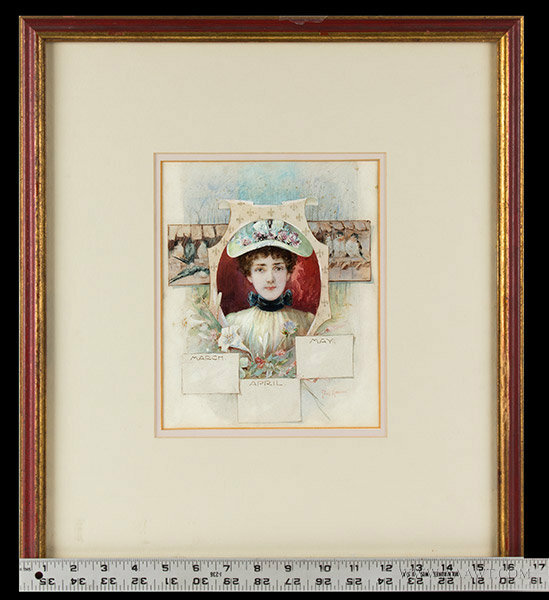 Overall very good condition, paper is floating in frame; should be properly mounted. 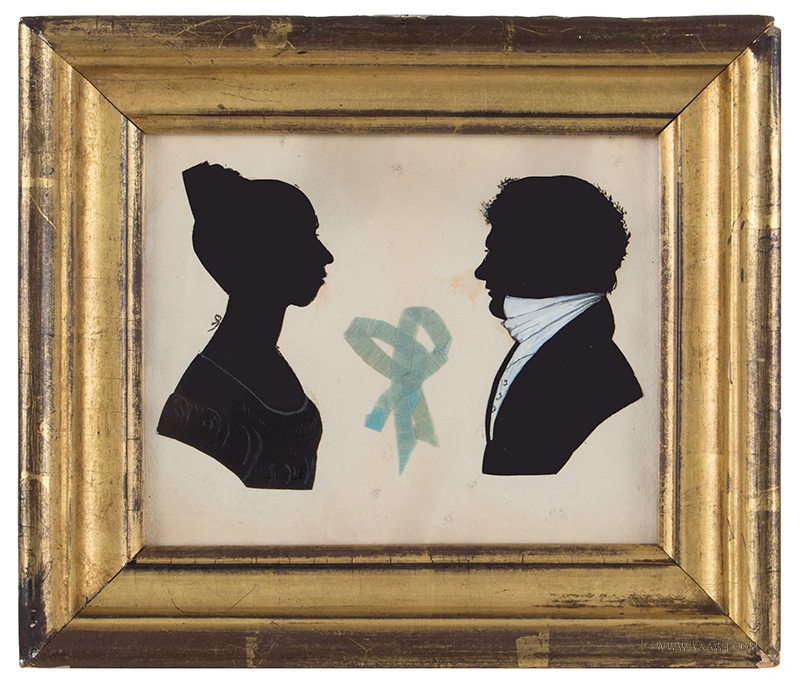 Martha Ann created these fascinating masterpiece silhouettes despite being born without the use of hands, using only her mouth and scissors as tools of creation. 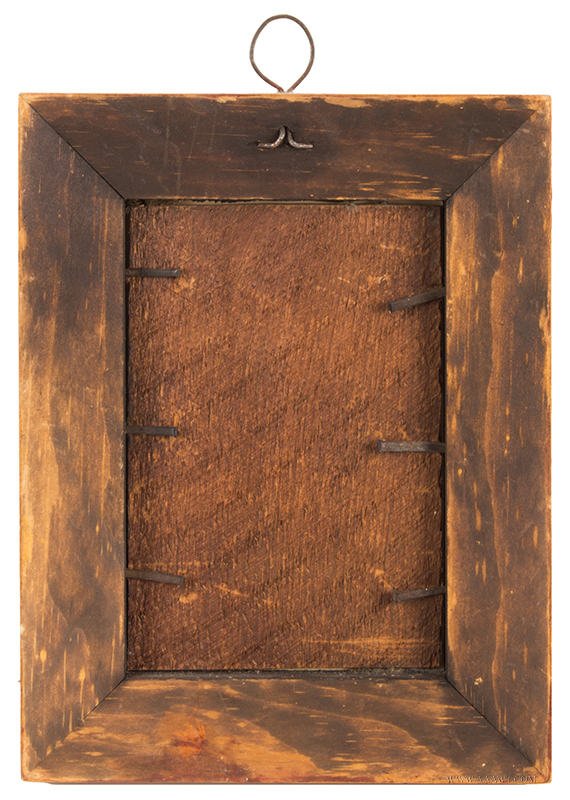 A most exceptional accomplishment. 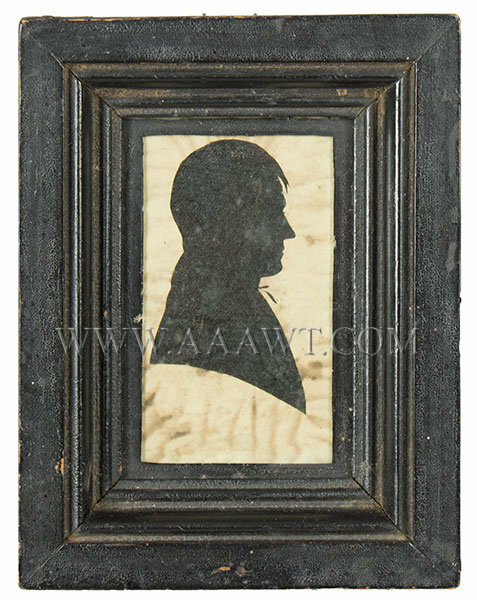 Silhouette signed on obverse, with "Cut by M. Huneywell with the astounding mouth" typewritten on verso. 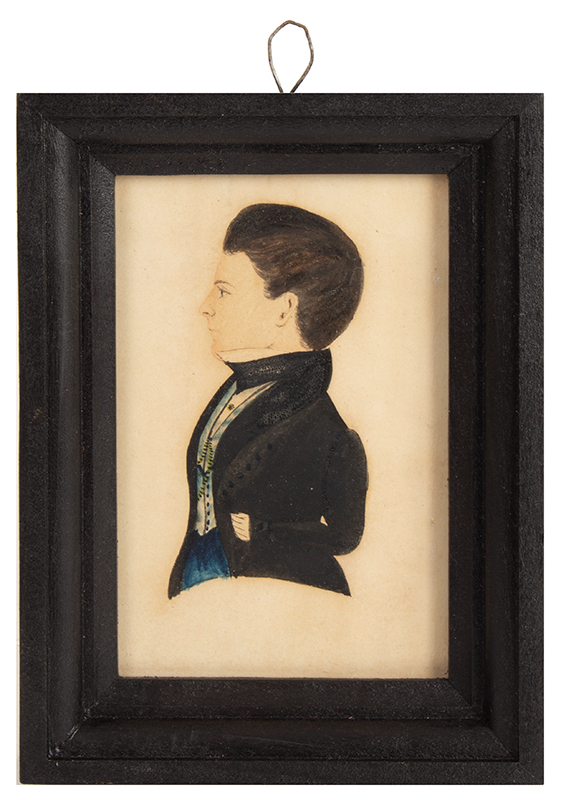 Overall dimensions: 4.75 by 5.5". 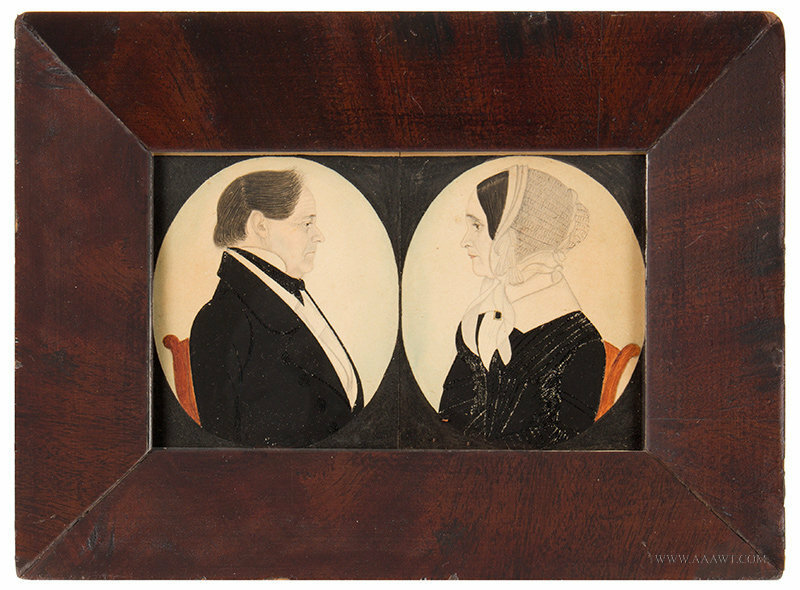 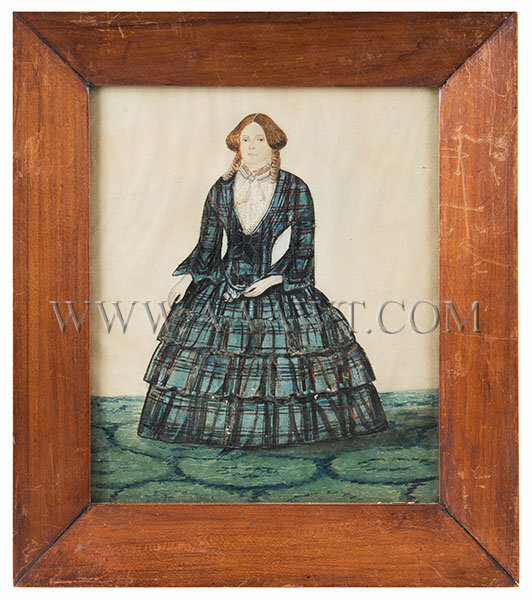 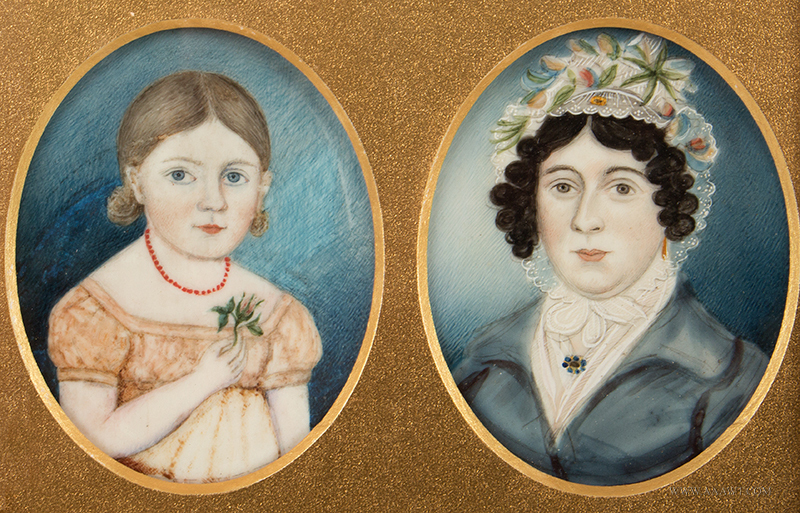 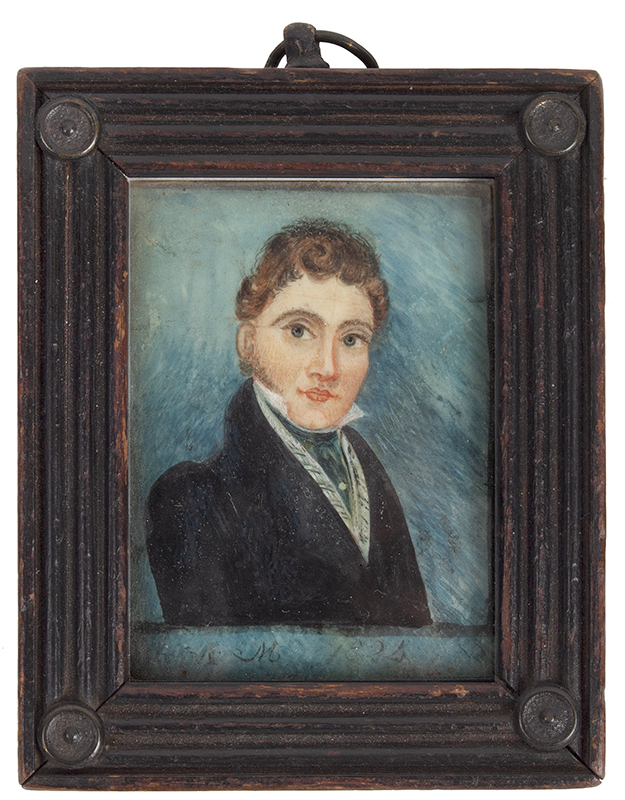 1840's full length portrait in birds-eye maple frame. 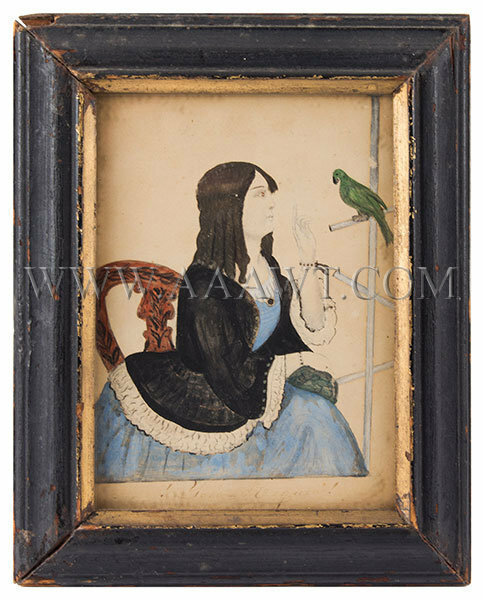 Dimensions: 13 by 14.25" frame, 8 by 9.25" sight-size. 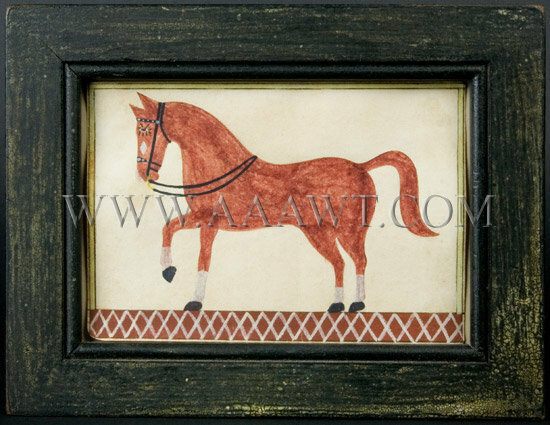 This chestnut-red colored horse with white stockings, black tack and a lively eye is shown standing on a brick red floor with white crosshatching. 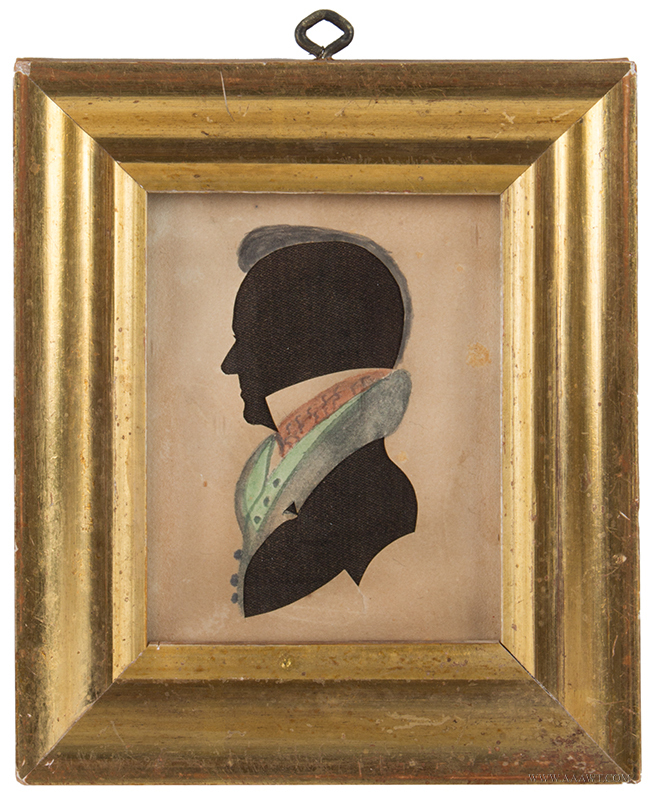 The artist trimmed the outside edges in yellow with fine black border. 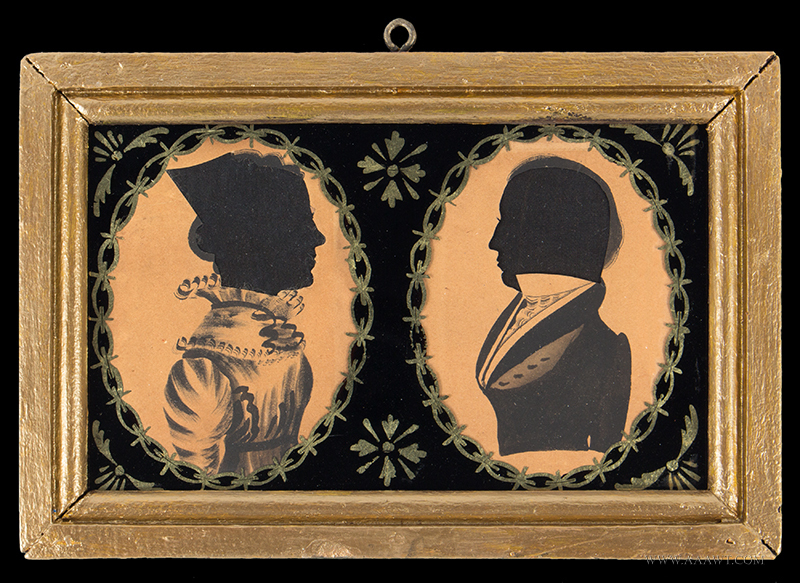 The frame with beaded liner was long ago over-painted black...whitish yellow paint is seen through the thinning black paint. 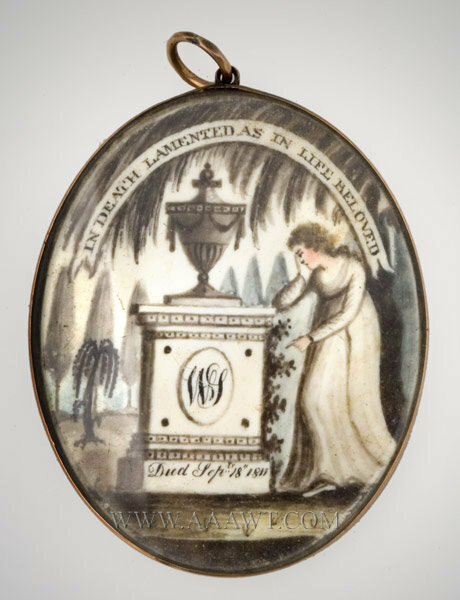 The back reads that Caroline is a descendant of William Bradford of Plymouth Colony. 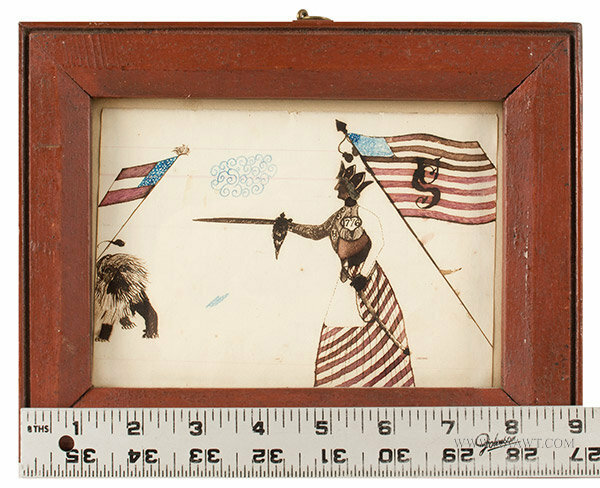 Dimensions: 3 by 4-inch sight size. 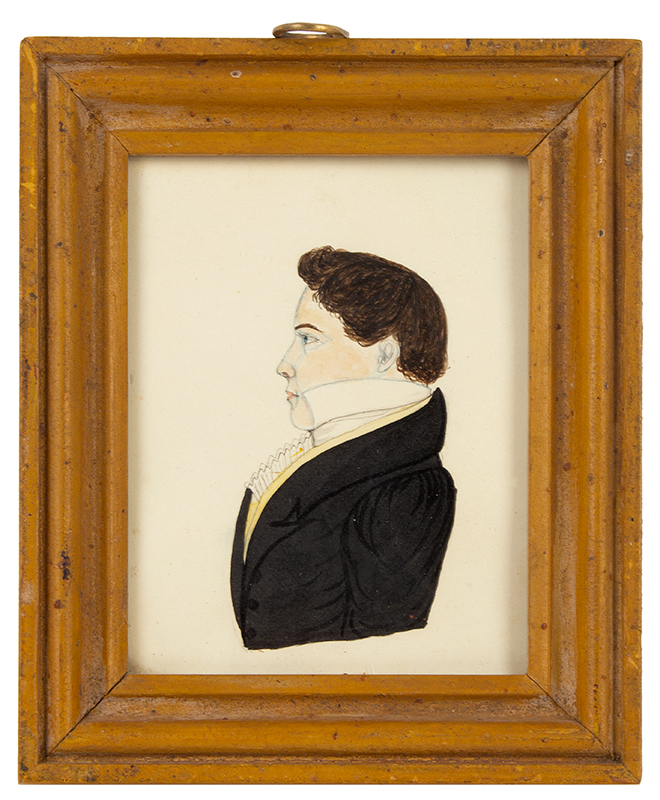 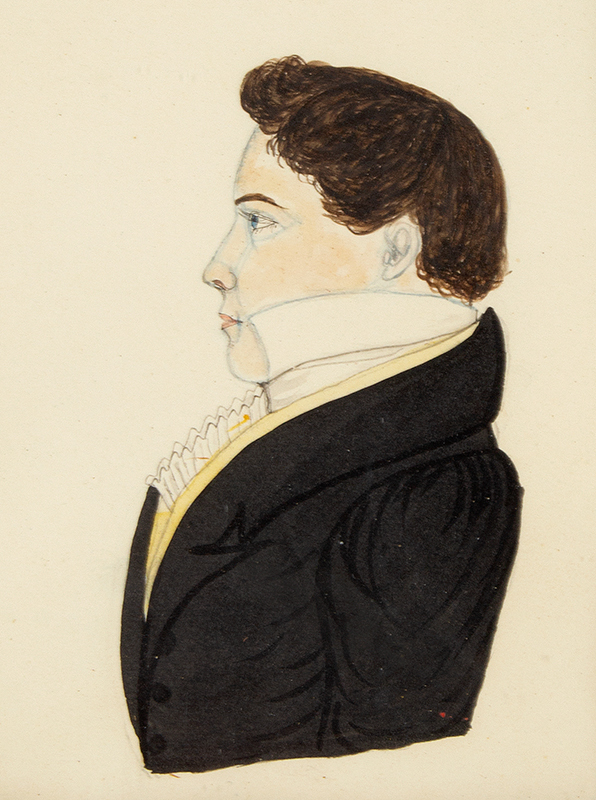 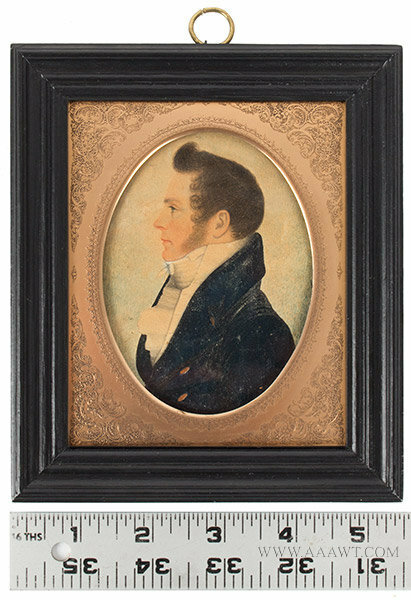 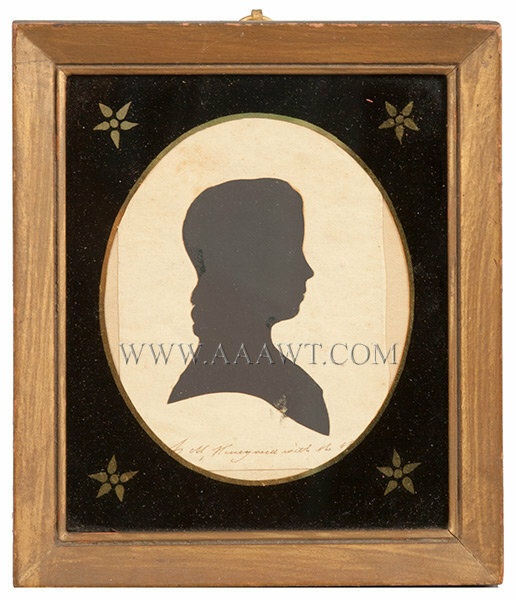 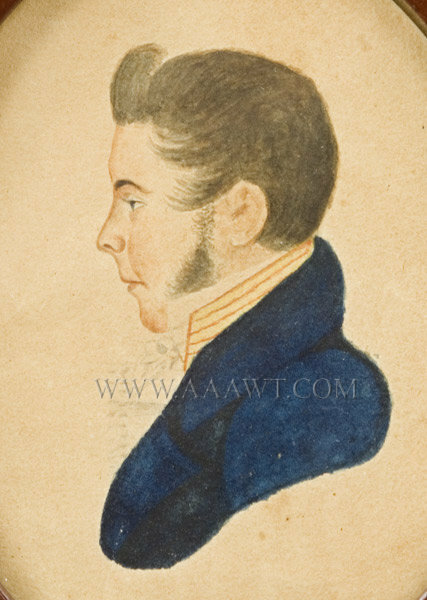 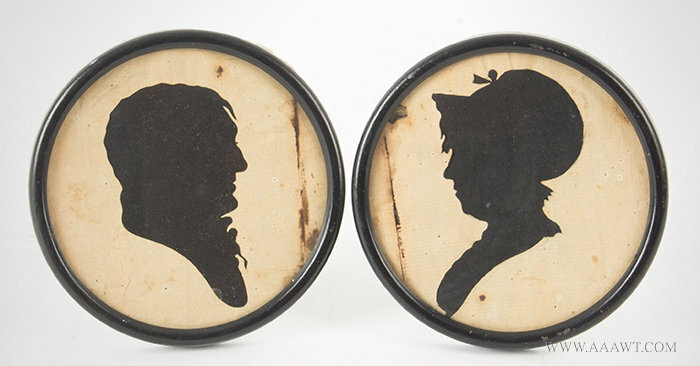 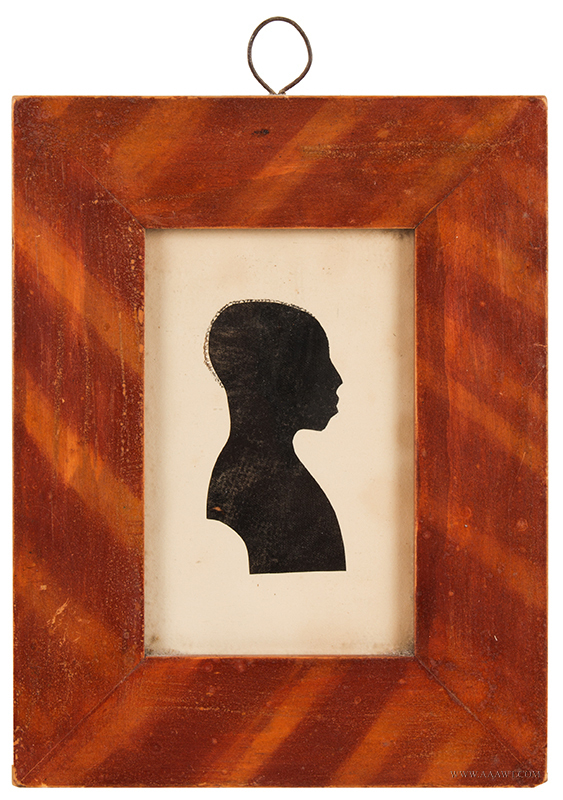 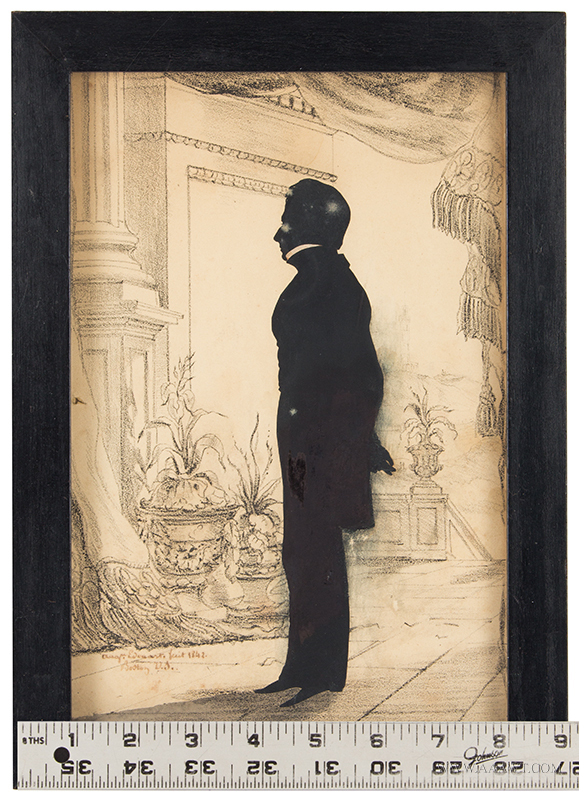 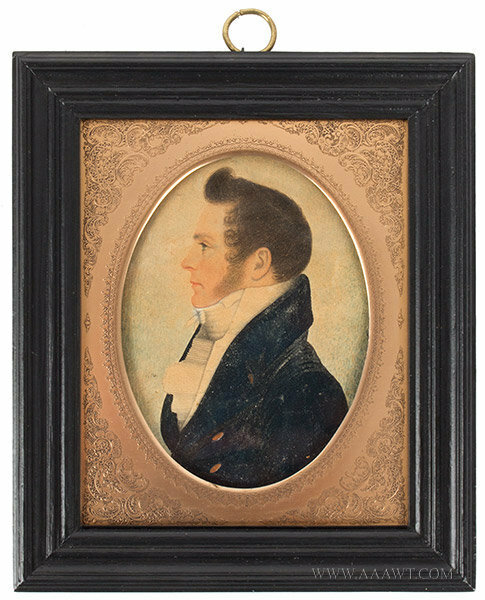 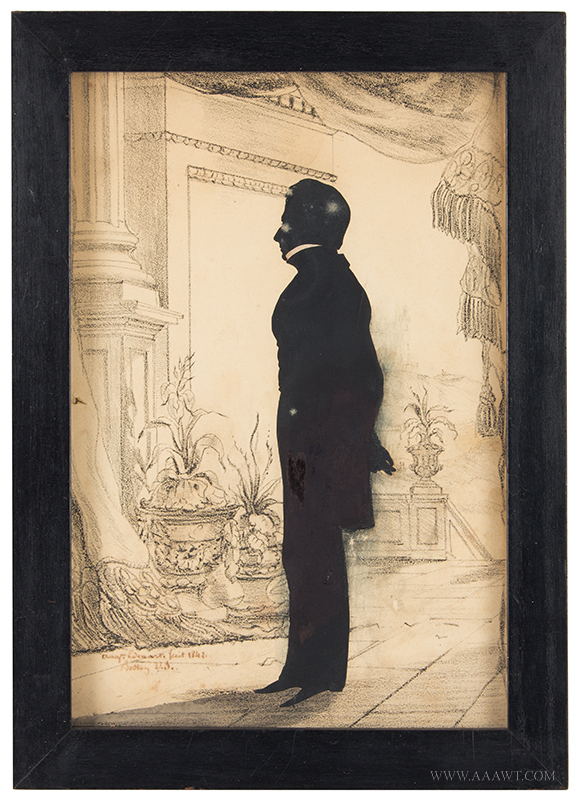 Brown was a renowned silhouette artist, surviving profiles are quite scarce. 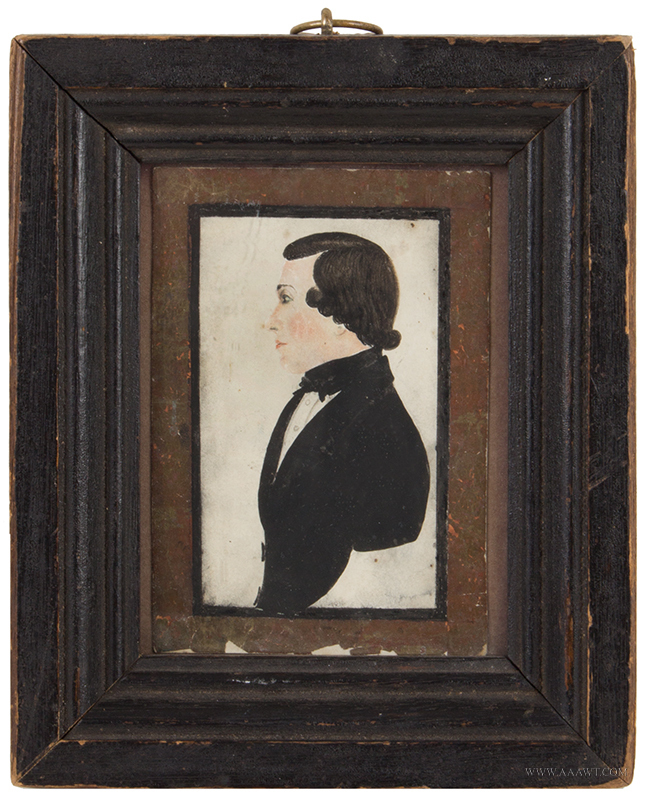 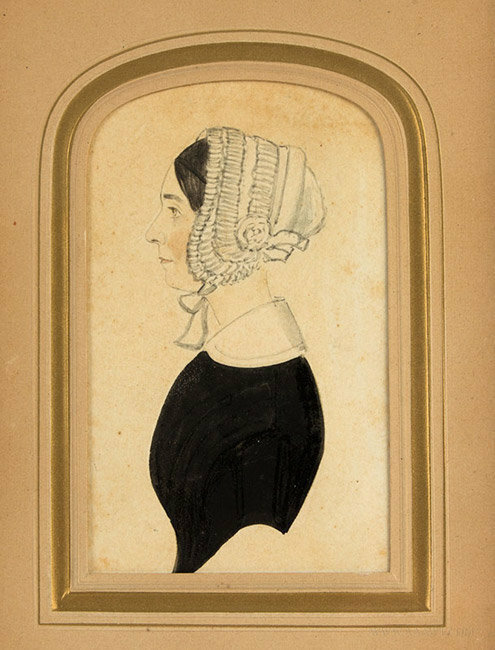 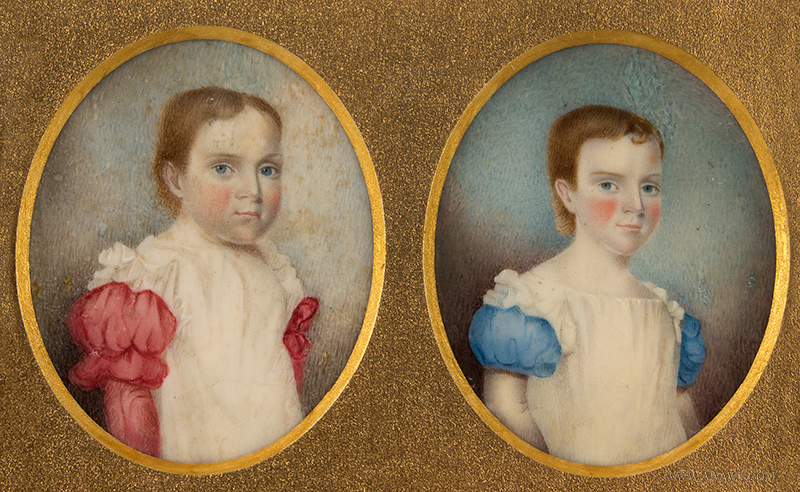 This example, full length, cut free-hand, is dated and signed on the lower left edge; now hidden by frame. 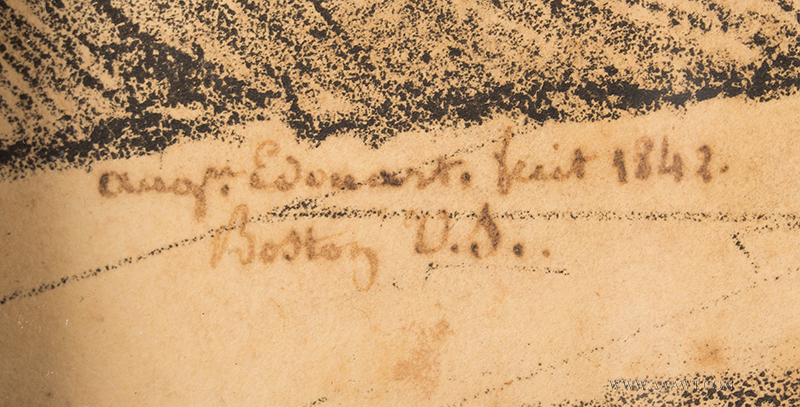 The work is dated and identified on the verso. 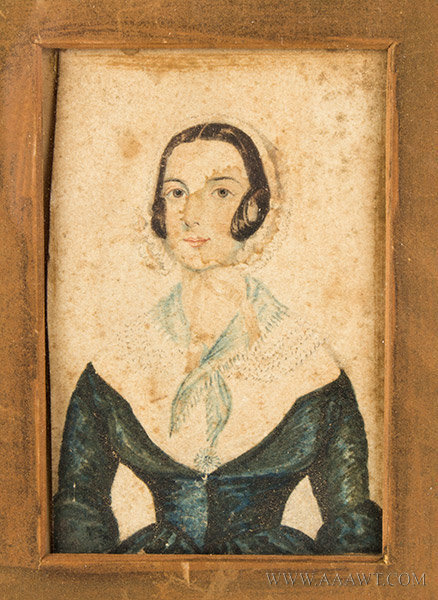 The lithograph featuring a possible vista of Charleston and a framed picture of Washington's tomb has light scattered foxing and some toning at lower left within carpet. 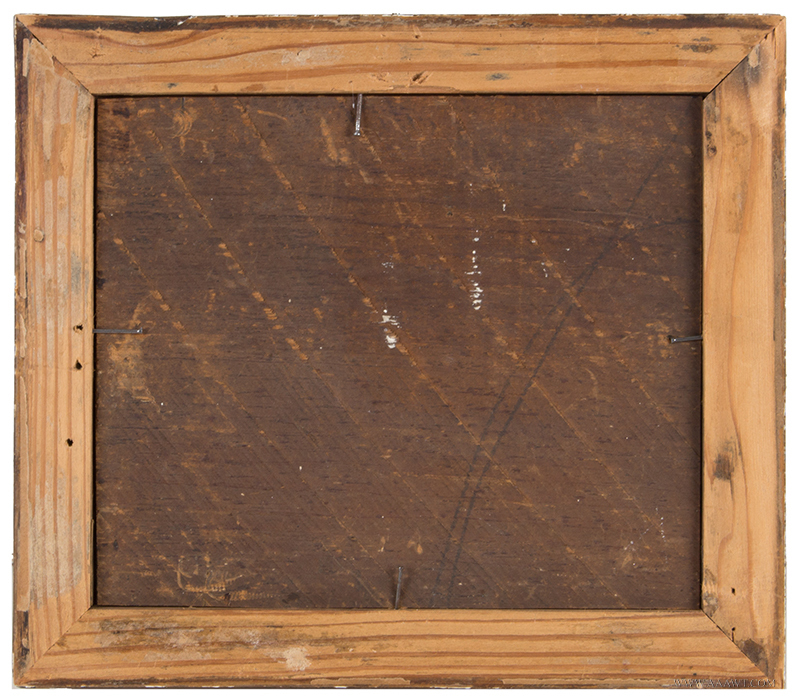 The backboard has a partial label advertising John S. Bird, Fancy Goods and instruments, "The Cheapest Goods in Charleston." 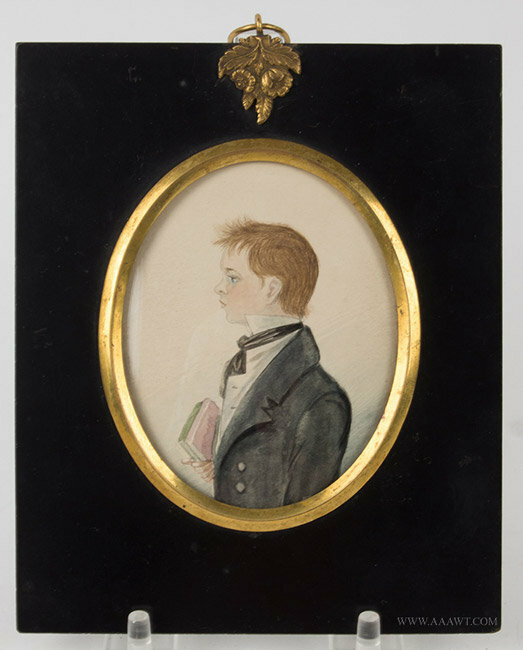 A letter in the collection of The American Folk Art Museum from Justus Dalee to his brother Richard dated May 8, 1843, states in part that "I went to Palmyra, as I wrote John and made $50 in less than 3 weeks, all money. 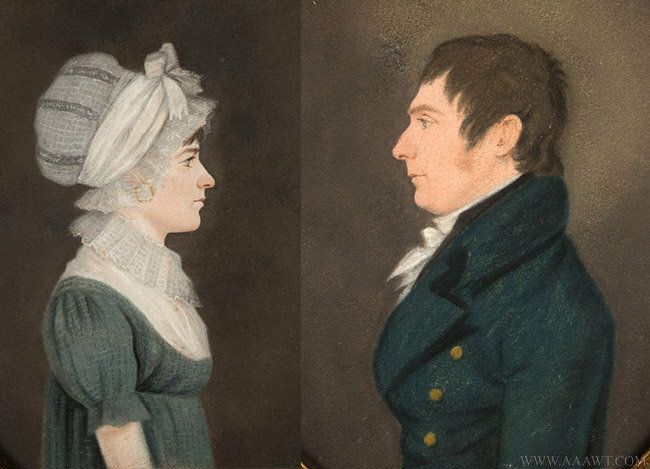 Mary and I started again April 11 and visited Palmyra a second time, made 50 to 60 dol's more, but instead of money it was mostly trade." 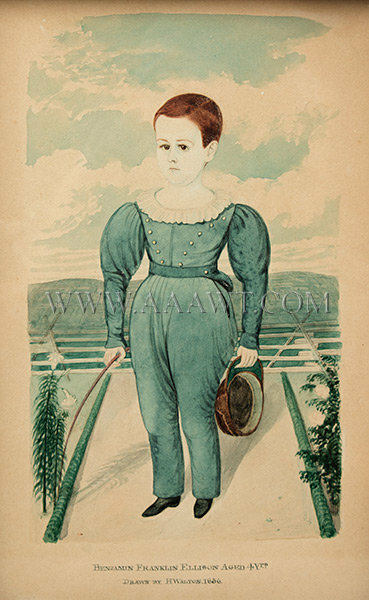 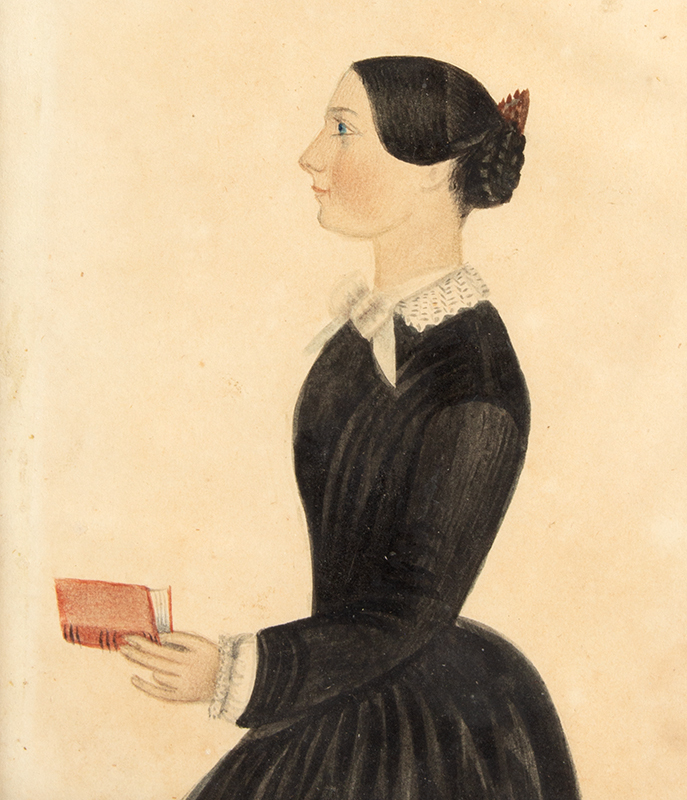 A closely related portrait of a standing girl in a red dress was formerly in the Barry Cohen collection and is illustrated in David A. Schorsch, The Barry Cohen Collection (New York: America Hurrah and David A. Schorsch, 1990), pp. 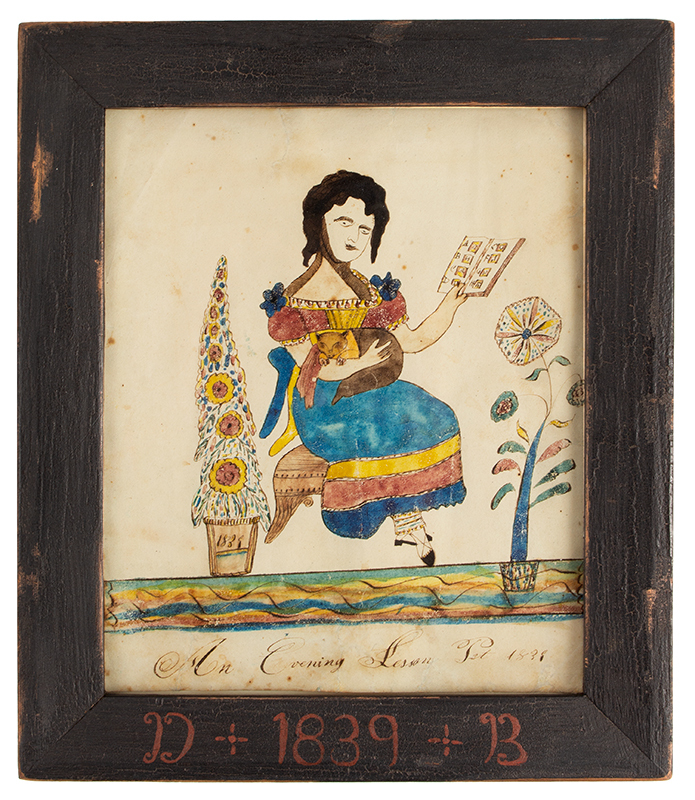 64-65, and Stacy C. Hollander, Stacy C. Hollander, Ed American Radiance, The Ralph Esmerian Gift to The American Folk Art Museum (New York: American Folk Art Museum and Abrams, 2001), p. 73. 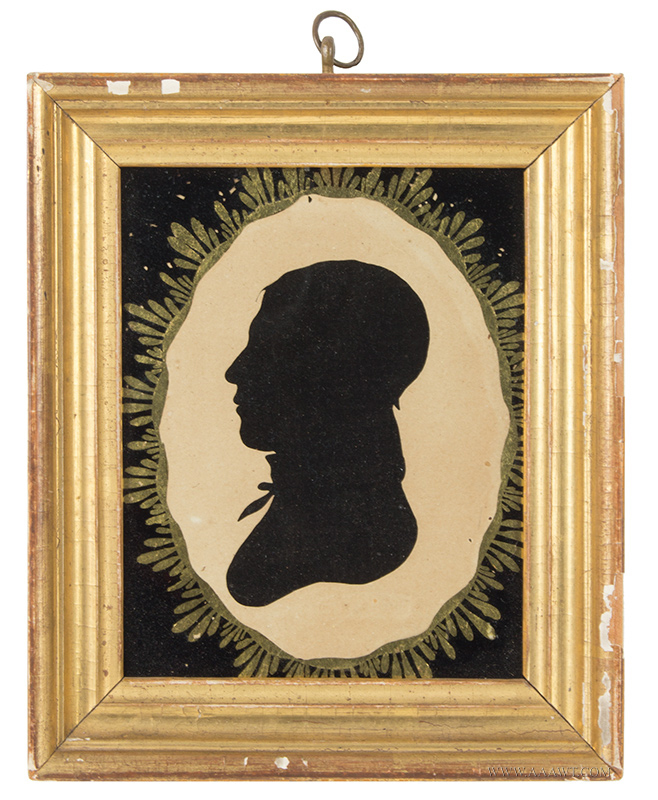 For a thorough examination of this artist and his work see Michael and Suzanne Payne, "To Please the Eye, Justus Da Lee and His Family," Folk Art Magazine, Winter 2004/2005, pp. 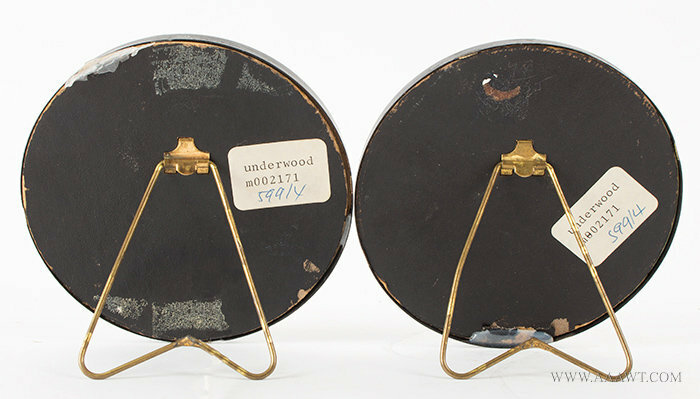 46-57. 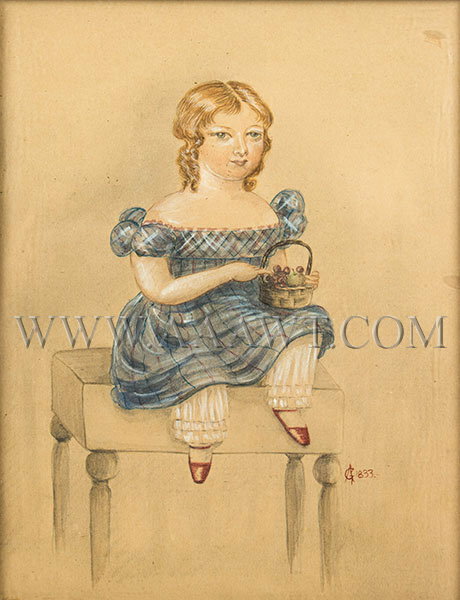 Watercolor, pencil and ink on paper, 4.75 by 2 7/8 inches, in the original gilt frame. 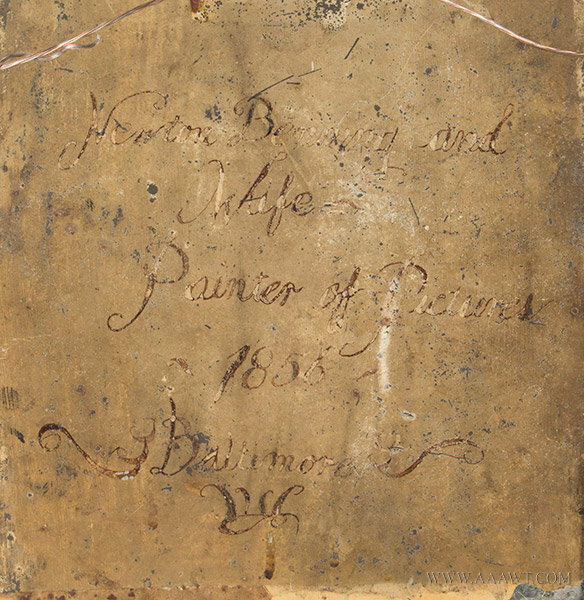 Inscribed in ink at lower center in block lettering: "Delineated in Palmyra, March, 1843"
Cleaned of some background foxing and de-acidified, refitted into its original frame to museum standards. 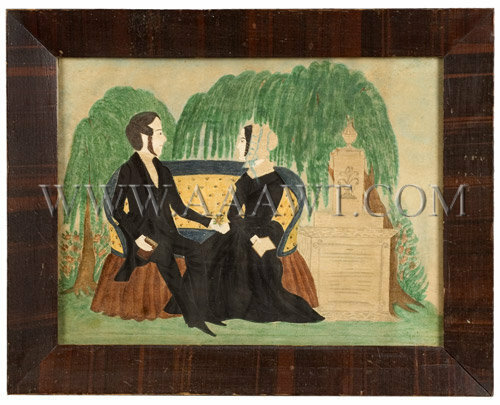 A possibly unique rendering depicting a seated couple within landscape of trees, flowers and monument. 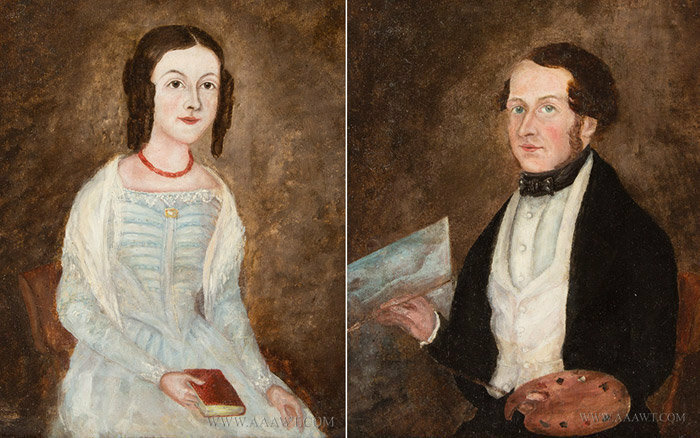 The gentleman offering a flower to the lady with both subjects holding a book. 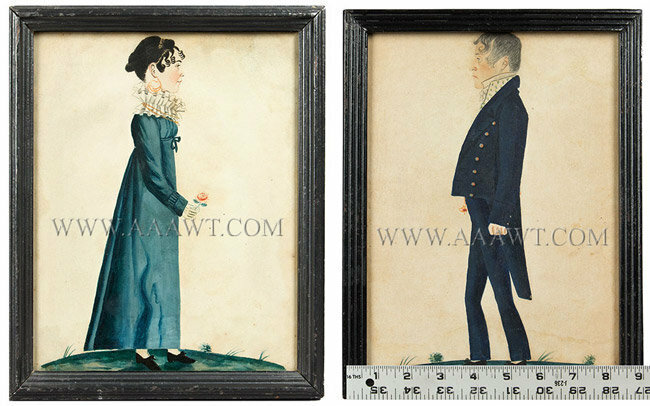 The ladies hat and collar and the gentleman's shirt are pinpricked adding texture to the work; colors remain strong. 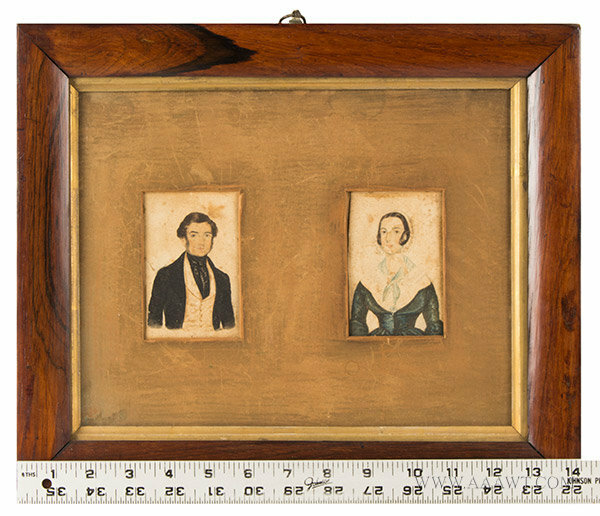 The work is mounted within a grain-painted frame of the period that measures 11 by 13.5-inches; the dimensions of view area are 8 by 10.75-inches. 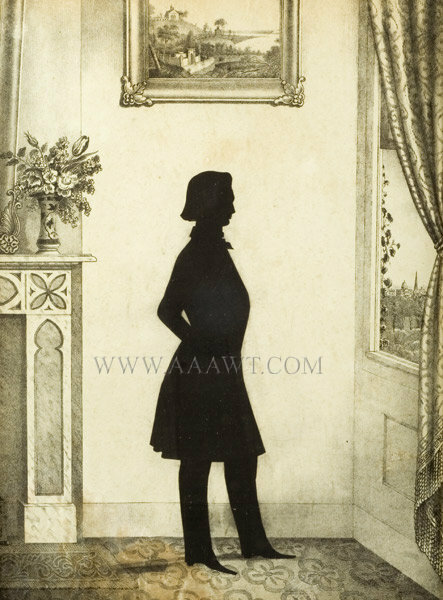 Hollow-cut silhouette of a man in profile to left. 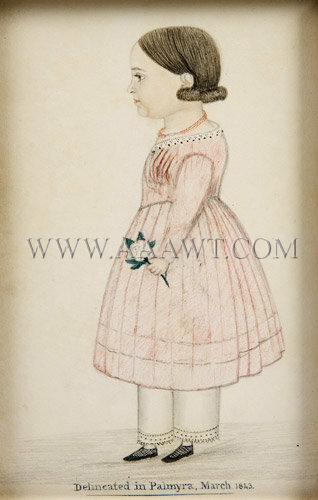 Cut paper with hair and clothing details in watercolor or ink wash. 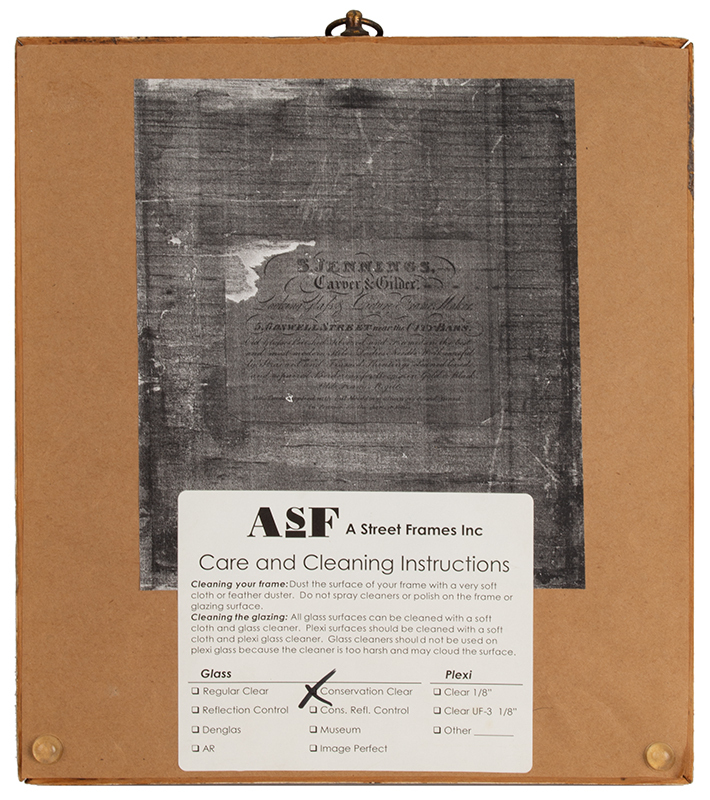 Backed with black textile. 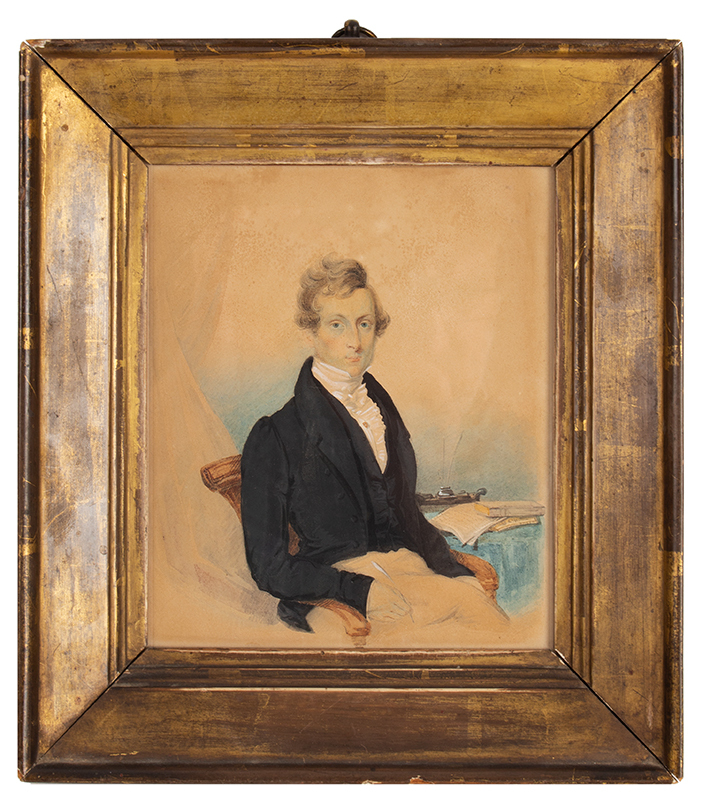 The work mounted in period gilt frame. 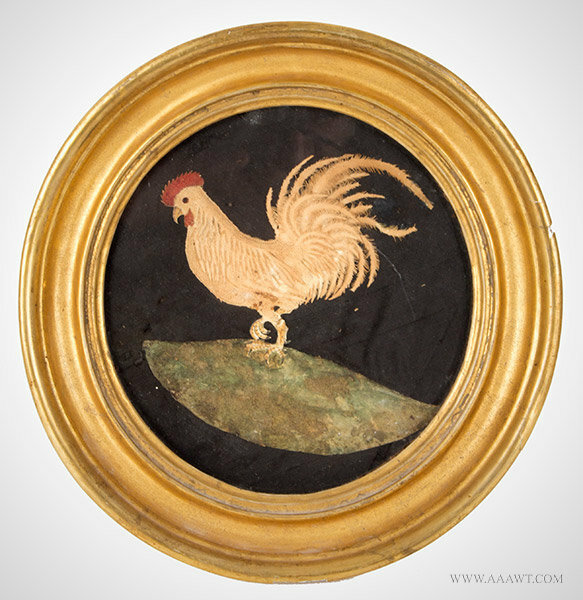 Now mounted under eglomise matt within recently painted gold frame measuring 7.5 x 5"; view: 6 x 3.5"